Hair loss is a common problem that can leave you feeling self-conscious. Men and women alike are devastated when their hair begins to thin or fall out. Many things, including genetics, stress, and illness can contribute to hair loss. 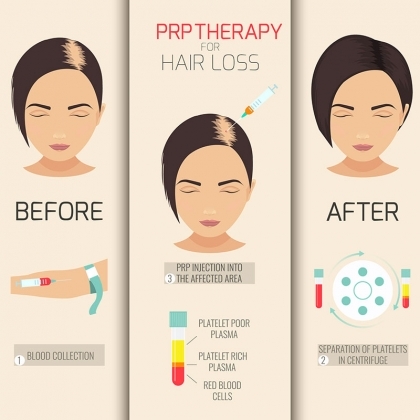 No matter the reason for your hair loss, however, platelet rich plasma (PRP) therapy may be able to help you regrow your hair. PRP is a natural way to stimulate hair regrowth, and it can be used in conjunction with hair transplantation to help speed up hair regrowth. PRP works by stimulating inactive hair follicles on your scalp. Your blood contains platelets, which are are cells in your blood that help stop bleeding. Platelets also possess growth factors that, when stimulated, encourage tissue growth and healing. The growth factors in platelets have also been shown to help slow down hair loss and regrow hair. Platelets contain epidermal growth factor (EGF), which encourages cell growth, collagen growth, and blood vessel formation. Platelet-derived growth factor encourages cell, blood vessel, and skin formation. Fibroblast growth factor-2 (FGF-2) encourages specialized cell and blood vessel formation. Together, these growth factors, along with insulin like growth factor-1 (IGF-1), vascular endothelial growth factor (VEGF), and transforming growth factor-beta (TGF-b), stimulate hair regrowth. When you go in for platelet rich plasma therapy, your blood is drawn and spun in a centrifuge, which separates platelet rich plasma from the rest of your blood. A local anesthetic is applied to your scalp before the PRP injections are given so you don’t feel any pain. No other medication or sedation is required for the procedure. A local anesthetic is applied to your scalp before the PRP injections are given so you don’t feel any pain. No other medication or sedation is required for the procedure. The results seen from PRP therapy will vary from person to person. You may see hair growth within as little as two months. You will need regular PRP therapy treatments to maintain your hair regrowth. Recovery from PRP is typically fast. Most patients recover within a few days. Some people experience swelling around the forehead area four to six hours after receiving PRP treatment. This is normal, and the swelling should start to subside within 48 hours. If your forehead swells after the procedure, it’s a good idea to avoid strenuous activities until the swelling subsides. Is a PRP Treatment Right for Me? 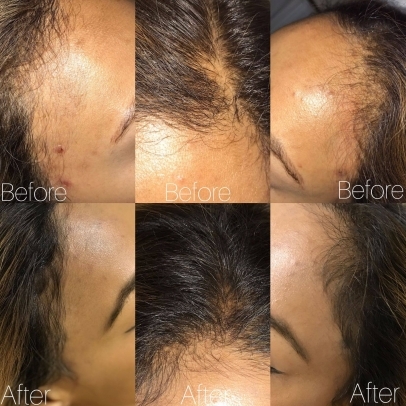 Platelet rich plasma therapy is a non-surgical, natural way to stimulate hair regrowth. If you have thinning hair or hair loss, you may want to consider whether PRP therapy is an option for you.